Sudden drops in blood sugars, mid morning cravings and afternoon slumps are often triggered by what you have eaten in the hours prior. It could be that you have had a sugary cereal for breakfast, or a couple of slices of toast and jam, or if you’re health conscious you might go for porridge, with milk and a drizzle of syrup/honey. Fuelling on carbs and sweet foods will spike your blood sugars… and what goes up must come down. Choosing high protein foods alongside carbohydrates and pairing these with healthy fats will slow this process down. An example might be putting nuts with your porridge, and adding berries for sweetness instead of syrup. Choose eggs and pair them with a rye bread and some vegetables or avocado. Switch your snacks for hummus and oatcakes or apple and nut butter. The chances are you won’t want to snack if you’re eating well-balanced meals that fill you up longer. Keeping your blood sugars steady ensure insulin, glucose and cortisol dance in harmony with each other, you will feel more energetic, crave foods less, and think clearly. 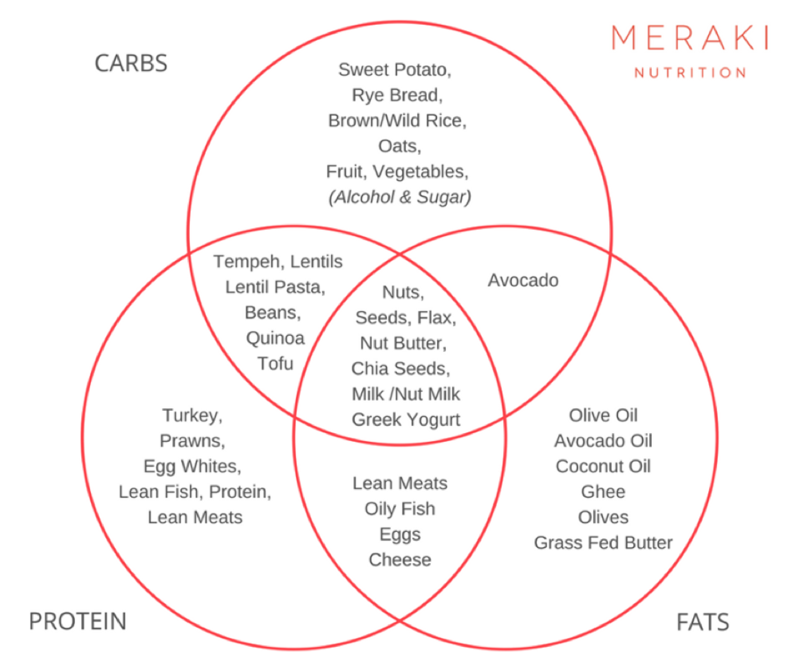 Blood Sugar Balance; Pair Carbs with Protein and Fats for slow release. The importance of sleep is so under rated. It kind of seems obvious that if you’re suffering with fatigue and low energy that of course you are going to sleep. But are you a napper? Do you have trouble getting to sleep at night – and staying asleep? The optimal amount of sleep required is between 7.5 and 8hrs every night, yet the average adult barely manages 5-6hrs. There are also different levels of sleep; a deep undisturbed sleep to ensure the body can rest is optimal to promote anti-aging, cell renewal, good digestion, and brain health. Switch off electronic devices such as phones, laptops, and tablets at least 1 hour before bedtime. Backlit devices stop the production of melatonin, a sleep enhancing hormone, which leads the brain to believe that it is still daylight, discouraging sleep. If you find this difficult, most devices these days have a night mode that switches the screen to a warm yellow light. Or if you really wanted to go all out, then you can buy blue light glasses online from Amazon. Create a bedtime routine that includes relaxation and meditation. It can be something as simple as reading instead of watching TV. Having a foot soak in Epsom salts. Listening to some relaxing music whilst breathing consciously. Lay off the heavy meals, sugary snacks and caffeine before bedtime. Eat your last meal at least 2hrs before bedtime, and choose a calming drink such as a night-time herbal tea or turmeric almond milk latte (also known as golden milk). Eating and drinking foods that are hard to digest, or stimulate the mind will prevent you nodding off. If you’ve tried all of the above and still feeling undeservedly fatigued it may be worth investigating your iron levels. This can be arranged quite easily with your GP, but do be aware that GP’s testing is limited and Iron is a complex mineral with many layers of deficiency. Never supplement Iron yourself without being tested, especially if you are male. If you’re not sure about iron, a nutritional therapist can arrange private testing for you that also looks in to your storage levels, the utilization of the Iron and B12. B12 deficiency is common in vegans and those that have low stomach acid, and digestion issues such as gas, bloating, and indigestion. It’s also very common in those who are taking medications such as metformin, omezaprole and statins. B12 is the vitamin that is responsible for the production healthy blood cells (that take up the stored iron). B12 is synthesized in the gut, so gut health is extremely important for B12. We get B12 from animal products, so if you are a vegan or vegetarian, you may want to investigate your current levels and enquire about a B12 supplement. This has made life changing effects for many of our clients in clinic that have been searching for answers to their fatigue. Stress and anxiety depletes many vitamins, B12 (thus affecting iron), magnesium (the mineral required for every function in the body) and the production of mood hormones such as dopamine, serotonin and noradrenalin. Addressing the root cause of stress is key in these scenarios, along side ensuring that your diet is rich in protein, healthy fats and vegetables such as dark leafy greens. For those that come to see us that are highly stressed we work on lifestyle and provide some short-term supplementation to get them onto a steady platform, whilst always working on the diet too. Exercise can work wonders for stress, don’t think big on this – think 15 minutes brisk walking each day. And whilst you are working, reflect on something positive that you can be thankful for and be kind to yourself. We touched on magnesium above. It’s the mineral that is responsible for every single chemical reaction that happens in your body at a cellular level. Without enough magnesium you might feel lethargic, drained and unmotivated. You may have brain fog, twitchy legs or cramps at night-time. Try sticking your tongue out in the mirror and if it quivers this is a physiological sign that your magnesium levels are low. It’s very easy to get magnesium in to the diet by reducing processed foods and increasing dark leafy greens such as kale, broccoli, cabbage and spinach. Introduce nuts and seeds as snacks and sprinkles on porridge, soups and salads. Having a relaxing soak in Epsom Salts (fancy word for magnesium flakes) could feature as part of your new bedtime routine, or if you don’t have a bath, try soaking your feet in Epsom salts instead. 2 cups is ideal for a bath and one cup for a foot soak. Supplementing with magnesium is an option, but there are different types of magnesium available, some stimulate and are excitatory and some help you to relax, so always ask a trained specialist for advice before ordering these. Once you have considered all of the above, you might want to investigate further into any underlying causes of your fatigue. Thyroid issues are often missed in regular GP testing, and it is possible to have an underactive thyroid without the obvious thyroid symptoms such as weight gain, goiter, and thinning hair. Leaky gut is exactly that, a gut that is leaking small particles of broken down food into the blood stream. In these cases you are likely to suffer from allergies and intolerances, but the real impact on fatigue as far as leaky gut is concerned, is that your gut is not in good health and therefore not able to absorb the nutrients it needs for energy. Fibromyalgia and Chronic Fatigue Syndrome (CFS) are very closely related. Doctors know a lot about the condition CFS, but not enough about Fibromyalgia, therefore support can be vague and misleading or even some cases dismissed as even a consideration. If you think there is something underlying that is driving your fatigue and low energy, but can’t quite put your finger on it, speak to either your GP or a Nutritional Therapist who can investigate the above and find out what’s really at the root cause.